LacocoDots Wrap Up 2012 with a Bang!! WOW!! We did amazing things in 2012!! I can hardly imagine what we will do in 2013! As a team, we did over $1,027,475 in retail sales and qualified 107 new stylists!!! That's truly amazing. We have iPad winners, glam getaway winners, promotions, stylist rebuilding their businesses in new cities, we branched into Canada, we took our families on trips, we splurged on things just for ourselves... in short, we styled our own lives. WE WERE AWESOME. Be proud and move into 2013 with the confidence that you can accomplish anything and the possibilities are endless. The promise of a new year and a fresh start is invigorating. It's not just about where you've been, but where are you going to go NEXT. 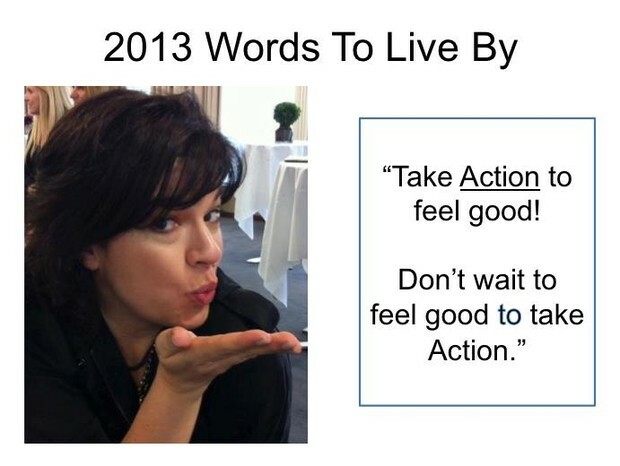 What will you do to be awesome in 2013? Congrats to everyone for another stellar month!! Everyone on this leader board earned at least 1500 PCV and got their volume rebate!! A special shout out is in order for Marie Phelan for making her first appearance in the #1 slot on the leader board!!! Way to go, Marie!! 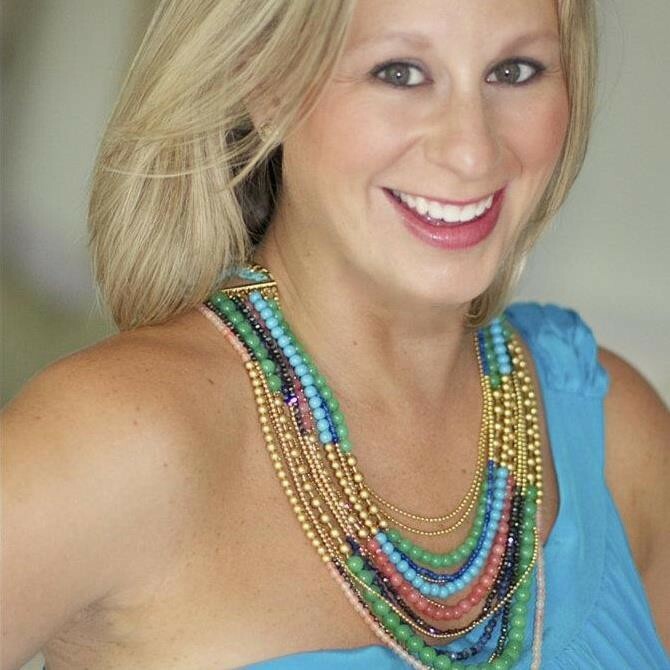 Another HUGE congrats to the number #1 seller on our team for 2012- Susan Carruth!! She sold $61,268.00!! While this is an incredible accomplishment in and of itself, it is more amazing because Susan travels long distances for most of her shows! She lives in the Blue Ridge Mountains of GA, and sets up shows with hostesses all over the southeast. So many of you shared such great tips as part of the Day 1 Challenge, and as I read through them, I wanted to share them with everyone!!! Here are just a few from some pretty successful ladies!! Enjoy! 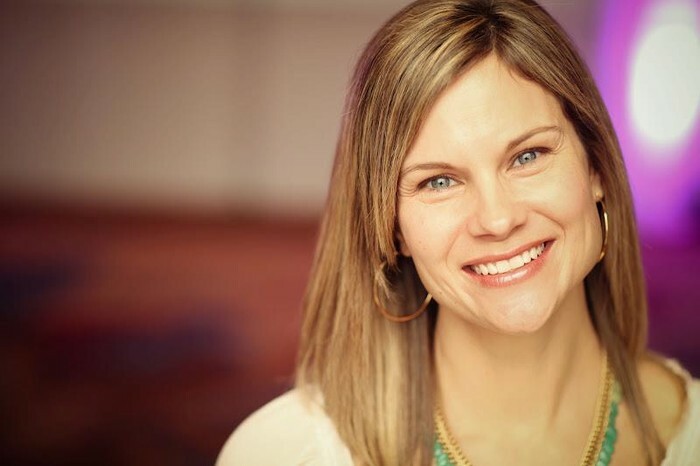 From Karla Woods: My Success Tip: While I am still very new to the Stella & Dot family and feel that I am in the position to be receiving more tips than I'm giving, but I have discovered things during my years of customer service and marketing that I feel will help me succeed in this business. One of my success tips is to develop real relationships! Recognize that everyone is different in their thoughts, actions, and preferences. Instead of assuming that everyone thinks the same, ask questions that show their individuality. Discovering their personality and developing a relationship with them will help you more than you know in catering to their wants and needs! 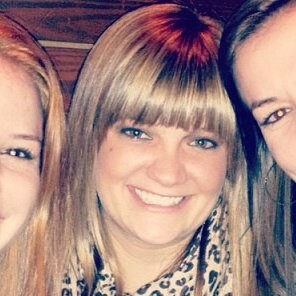 From Lauren Train: Plug into the Stella & Dot community. As I have read the message boards, I have gotten great tips and been encouraged by so many other stylists out there. There are girls that I don't even know who have reached out to me to encourage and support me and the times that I don't know what to do or have slacked on my business, all it takes is jumping on a call, attending a Stella & Dot event or seeing someone else in my community to promote to remind me that I can do it too and to help me plug back in! 12 Days of Stella and Dot Winner! I loved all the participation we had for the 12 days challenges!! I hope you were inspired to do some small actions that resulted in some positive momentum for you in the new year!! There were four members of our team who did at least 8 of the 12 challenges and I did a drawing to pick the big winner!! See the video for the drawing! All four ladies deserve a big hand for working these challenges in to their busy schedules! Roxanne Harrell, Lauren Train, Ashley Bardash and Karla Woods- you are all awesome!!! Need a little inspiration to get yourself in gear for 2013?? Sometimes, pictures speak louder than words! 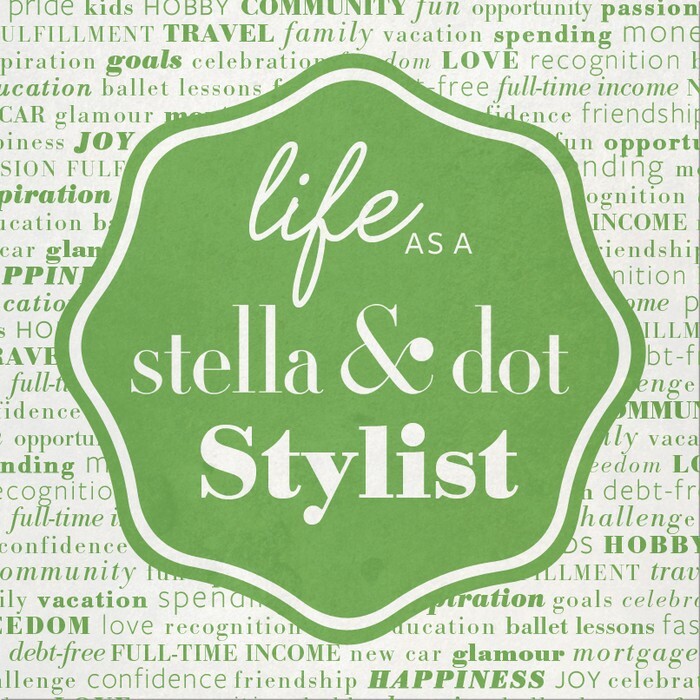 With the sponsoring special, you’ll be sharing your love for your Stella & Dot business, with your social connections online and on-the-go! Why not create a simple photo album that you can use as a talking point to highlight your life with Stella & Dot! 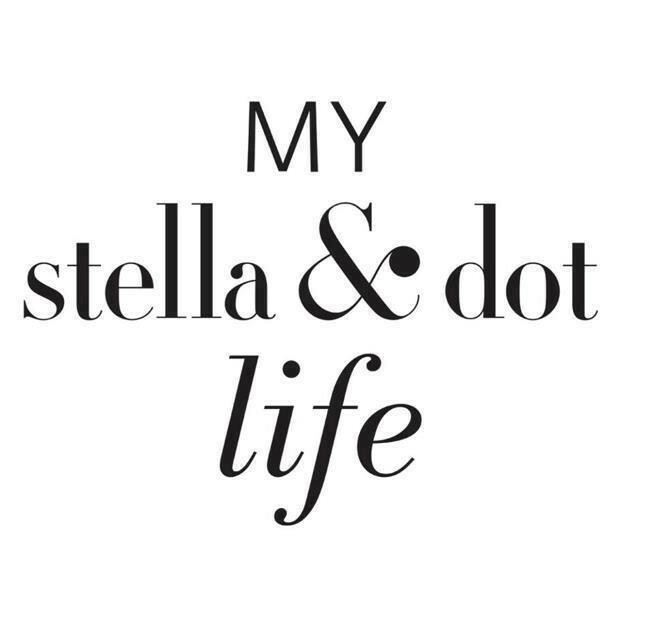 Check the Stella & Dot facebook page for more details. Free bangle from the new collection!! 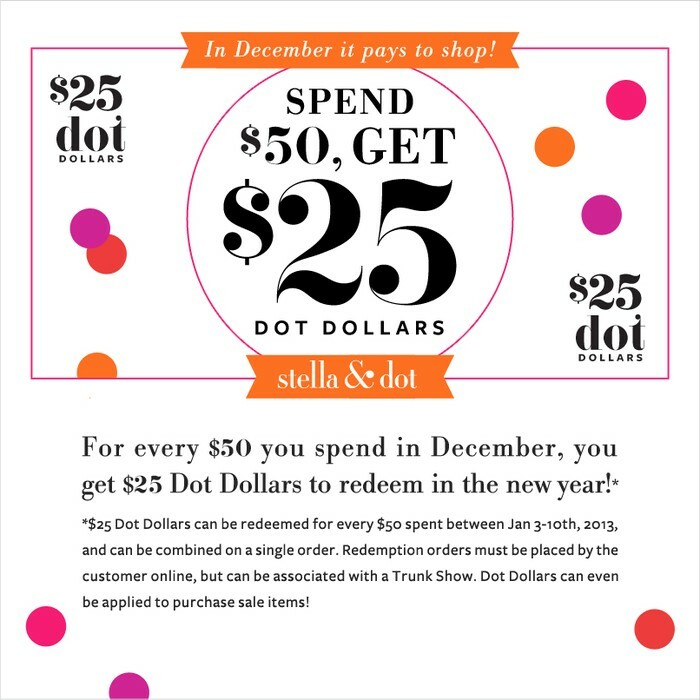 Dot Dollars redemption begins Thursday!!! Dot Dollars was designed to keep your sales cruising through the end of December and into the new year. It’s a great way to book beginning of the year Trunk Shows, before the debut of the Spring line, for customers to get what they really want for themselves after all that gift-giving! Check the lounge for video's and words to say to make the most of this special opportunity!